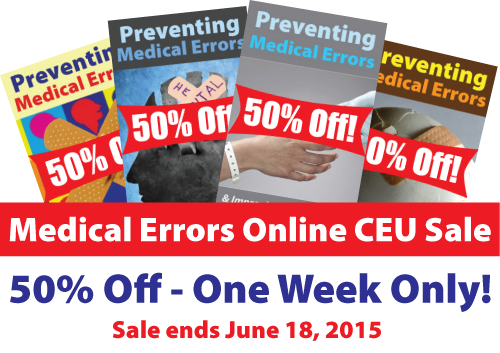 Save 50% on medical errors online CE courses during our Medical Errors Online CEU Sale – one week only! Required for license renewal of all Florida licensees. Sale ends June 18, 2015. Professional Development Resources is approved to offer continuing education by the American Psychological Association (APA); the National Board of Certified Counselors (NBCC); the Association of Social Work Boards (ASWB); the American Occupational Therapy Association (AOTA); the American Speech-Language-Hearing Association (ASHA); the Commission on Dietetic Registration (CDR); the California Board of Behavioral Sciences; the Florida Boards of Social Work, Mental Health Counseling and Marriage and Family Therapy, Psychology & School Psychology, Dietetics & Nutrition, Speech-Language Pathology and Audiology, and Occupational Therapy Practice; the Ohio Counselor, Social Worker & MFT Board; the South Carolina Board of Professional Counselors & MFTs; and by the Texas Board of Examiners of Marriage & Family Therapists and State Board of Social Worker Examiners. All courses are reported to CE Broker within one week of completion. Preventing Medical Errors in Behavioral Health is a 2-hour online continuing education (CE/CEU) course that satisfies the medical errors requirement of Florida psychologists, counselors, social workers and MFTs. Preventing Medical Errors in Speech-Language Pathology is a 2-hour online continuing education (CE/CEU) course that satisfies the medical errors requirement for license renewal of Florida speech-language pathologists and audiologists. Preventing Medical Errors & Improving Patient Safety is a 2-hour online continuing education (CE/CEU) course that addresses the impact of medical errors on today’s healthcare with a focus on root cause analysis, error reduction and prevention, and patient safety. This course satisfies the medical errors requirement for license renewal of Florida occupational therapists and other allied health care professionals. Preventing Medical Errors in Nutrition & Dietetics is a 2-hour online continuing education (CE/CEU) course that addresses the impact of medical errors in the practice of nutrition and dietetics. Preventing Medical Errors in Nutrition and Dietetics is a 2-hour online video course that meets the Florida requirement that dietitians and nutritionists complete a course on the prevention of medical errors each renewal. This entry was posted in Marriage & Family Therapy CE, Nutrition & Dietetics CE, Occupational Therapy CEUs, Promotions, Psychology CE, School Psychology CE, Social Work CE, Speech-Language Pathology CEUs and tagged CE Broker, Florida, medical errors online CEU, Medical Errors Online CEU Sale, Preventing Medical Errors & Improving Patient Safety, Preventing Medical Errors in Behavioral Health, Preventing Medical Errors in Nutrition & Dietetics, Preventing Medical Errors in Nutrition and Dietetics, Preventing Medical Errors in Speech-Language Pathology, Prevention of Medical Errors, Professional Development Resources by Gina Gunderson. Bookmark the permalink.